Behind the Lines starts with a flash forward. Someone spotting an old friend facing what appears to be a firing squad just before a shell explodes, obliterating the scene. His old friend, he surmises, is now dead. Then we are introduced to Peter Rawley, a lieutenant with an artillery battery in the British army of World War I. To him, war is a great man-making experience. It was all intensely interesting after a quiet humdrum life as a provincial insurance man. Rawley likes Major Cane, Captain Whedbee, and Lieutenant Piddock. And he definitely like the young ambulance driver, Miss Berney Travers. But he doesn’t care for Rumbald, a man of considerable girth who enjoys liquor, prostitutes, and embellishing stories, and taking the easy jobs. After a particularly harrowing time on the front line, Piddock needs a rest. He heads out for leave, and a shell takes out Cane and Whedbee. Rumbald, now the ranking officer, decides to call Piddock back to the line so that he might enjoy the cushier rear job. Rawley objects. They fight. Rumbald ends up with a broken neck. Rawley has a license to kill any number of Germans, no matter how good they are, but he has killed a superior officer. For that he could hang. He deserts, and lives an underground existence in the devastated battlefields with other deserters. He teams up with Alf, and they scrounge for anything salvageable in the old trenches and whatever they can steal for stores. They have run-ins with the self-appointed “lord” of the deserters and the Germans. Rawley masquerades as a chaplain and runs across Berney. When he takes a dead man’s place in another battery, he comes face to face with Piddock, and learns he never should have run. At times, the story bogged down. Especially when their dug-out is caved in by other deserters, Rawley and Alf spend considerable time digging their way out. At first, Rawley didn’t seem too likable, being so fond of being at war. And the first chapter is misleading. You think you know how the story ends, but it’s different. Rawley grows on you, though. And the ending is filled with promise. 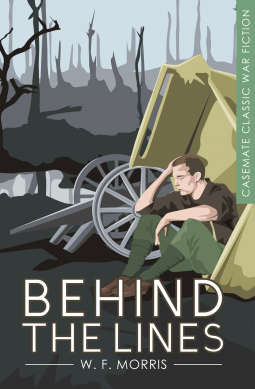 Behind the Lines offers a look at the horrific living conditions experienced by the men who fought in the Great War. The author, W. F. Morris, is included among them. Just another reminder of how grateful we should be to our veterans and current military. Sounds like a very interesting book - but maybe depressing. Thanks for the review.